The 35.6 metre motor yacht Bac O Booc, listed for sale by Babb Rawlings at HMY Yachts, has been sold with Jim Hill at Allied Marine introducing the buyer. Bac O Booc, formerly named Star Sapphire, was designed by Kerim Demir, built by Turkey’s Bilgin yard in wood and epoxy to RINA class, and delivered in 2007. The interior was designed for the original owner who obviously loved the colour blue as there are blue Italian marble counter tops on the saloon bar, cabins and bathrooms while doors and windows throughout have blue Murano glass accents. The large saloon of this yacht for sale is decorated in shades of blue and has comfortable seating in the lounge area in front of an entertainment centre including a large flat-screen television, while the forward area offers formal dining with seating for eight guests. Accommodation is for eight guests in four cabins consisting of a main-deck master suite, a second master suite below deck and two guest cabins, all with full en-suite facilities. In addition, there are quarters for five crew. Other features include a hydraulic swim platform, a spacious flybridge with a Jacuzzi, a barbecue grill and a bar plus a gym that can be converted into a possible fifth guest cabin. She also has a large garage for water toys and is fitted with zero-speed stabilisers. 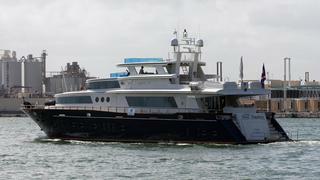 Twin 1,825hp Caterpillar engines give her a cruising speed of 15 knots and have extended warranties until 2017. Lying in West Palm Beach, Florida, Bac O Booc was asking $2,399,000.